Tyga Performance is the only company in the world offering a full stainless steel, cone section expansion chamber system for the Yamaha YZ250. This exquisitely crafted pipe is designed to give an increase in power all the way through the rev range, without sacrificing top end and over rev performance. 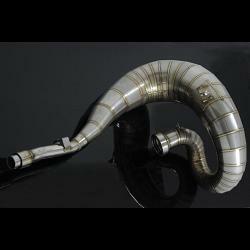 The complete exhaust system is modelled in Solidworks CAD software for perfect dimensions. Then each cone section is accurately laser cut from 1mm 304 stainless, and painstakingly hand rolled and welded by our skilled craftsmen. Giving you not only the most attractive expansion chamber in the market, but the performance to match. TYGA exhaust springs are used at the cylinder joint, but all other OEM hardware is retained to secure the chamber in place. Please use the standard YZ250 rubber boot at the joint between the chamber tail pipe and the silencer link pipe. This chamber can be used with stock silencer or TYGA Performance part EXSL-0050 and EXSL-0051. As with any performance modifications, we recommend carburetor settings be checked an optimized before enthusiastic use. *High temperature sealant is recommended at the cylinder joint.